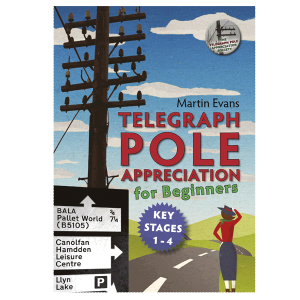 B eing a life-long anoraksic I was out indulging one of my other jotter-pad, biro, OS map, compass, GPS hobbies – geographing – recently, when I came across a pair of vertically challenged telegraph poles near Cyfronydd in Powys They just have to be the world’s smallest. They were separated by just a few feet and carrying a cable between them; but that was it. They weren’t raising the wires over a road or across a stream or anything. The cables just come up from the ground, went through the air for 10 ft or so via these two mini poles and back into the ground again. The mind truly boggles… And all just a stone’s throw from my house which is on top of the hill behind the pole in the picture on the right. Meanwhile, please accept my apologies for the dearth of posts about all things telegraphic recently. Excuses being, erm, our cat had a dicky stomach, I’ve been busy, er… thin on the ground! I just don’t know where the time went. Mr Cummins, I’m coming to your stuff soon, I promise. This pole is my pole of the month for 3 reasons. 1. It’s the last in a line of ye olde GPO poles running up from Ruthin towards Cerrigydrudion. 2. It’s only really visible in winter when all but the ivy remains in leaf. And it’s on a fast bend too, so nobody (but me) ever notices it. F urther thanks to Ian Jolly for December’s (and probably January too) pole of the month. This is another from Ian’s photographic archives of telegraphic eccentricities. This 23 armed beauty was at the rear of the former Post Office in Tarvin, near Chester. 23 Arms plus a ‘ring type’ DP beneath it. The more distant photo below shows it to tower above the nearby houses. All submissions for P.O.T.M. to martin@telegraphpoleappreciationsociety.org are greatly appreciated. V ery many thanks to Ian Jolly for this month’s telegraph pole of the month. You might wonder what’s so special about this one until you look a little closer. This was taken a few years ago in the Main Street, Combe Martin, Devon – before digital camera and so is a scan of the original photo. You will notice that the pole goes through the house roof and It begs the question – which came first? Ian has sent us a load of photographs and telegraphic titbits recently – which we’ll be dripping on to the site in due course. Watch this space. This month’s photograph of a fabulously busy pole was submitted by Maynard Floyd, who we suspect is a lover of winegums. A group of five of us were travelling through Vietnam on Mopeds on a lads holiday and this telegraph pole was outside our hotel in central Ho Chi Minh and it caught my eye – it is just so frantic! Imagine what happens if one line goes down! how would you trace the problem?? Please send your submissions for possible pole of the month to : martin@telegraphpoleappreciationsociety.org Ta! Thanks to our Ireland correspondent(s), Tom & Aideen for this month’s (and probably next month’s) pole of the month. Apparently, they found this on their grand tour of Ireland a few weeks back. They were looking for an antiquarian bookshop at the time and in the sound between Achill Island and Achillbeg Island, Co. Mayo, found this amphibian distribution pole. A fine candidate for P.O.T.M. if ever there was. The brown sign in the background tells us it’s near Bala Leisure Centre, exactly as per the legend. It’s got 5 arms, it’s got a shed load of different insulators, including a few badly shot up. And I nearly got killed by a truck as I was trying to photograph it. It’s the only one of its kind along this stretch of the A494. There is a pole in there somewhere – and it’s arguably the busiest telegraph pole on earth. This photo came to me from a friend via their friend in turn via their friend. So I have no idea who to credit for the photo and indeed whether I’m allowed to use it or not. Ho Hum! Anyway, it’s in India somewhere. And apparently heavily dressed poles like this are not uncommon over there. By the way, for those of you wondering what happened to May’s P.O.T.M. I have this to say: oops!